What do you do when your child says ‘I’m bored’? If you’re like me you might say: “Go outside” or “Play with your sister/brother” or “Play with your [insert latest toy]” or my favourite “Go make something”! I’m a true believer that if you leave children to work through their feelings of boredom they come up with some really fun and inventive ways to spend their time. But sometimes they need some extra help getting there. To get from ‘bored’ to ‘engaged’ requires inspiration to strike. 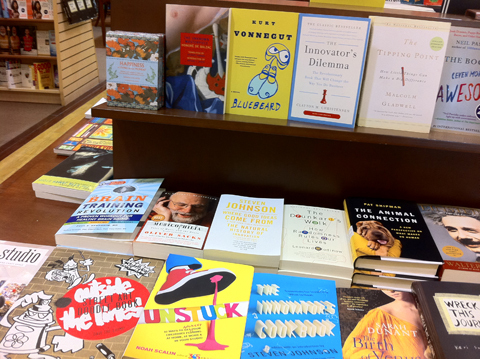 THINK BIG is simple book that does just that – it sparks the imagination. This book opens us to a world of possibility for finding joy through many art forms available to us and acknowledges the need for a “brave heart” to make it happen. I highly recommended this easy read for children of all ages to inspire us all to THINK BIG. 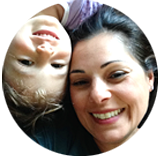 Next time your faced with boredom in your home connect with your child through a story like this one and enjoy the thinking that unfolds. Please share this post and comment below. What books you’ve read lately that have inspired your creativity? 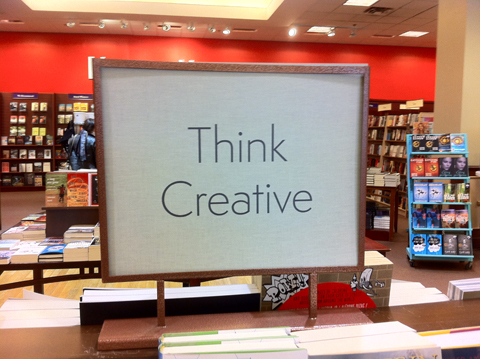 Do yo ever get into a trance like state as you walk through certain stores that inspire you? That’s what happens to me when I walk through a bookstore. Last time there, as I walked down the main aisle, I was captivated by a number of beautiful cover designs that spoke to me… a few I was familiar with but many, I hadn’t seen before. Ah ha! 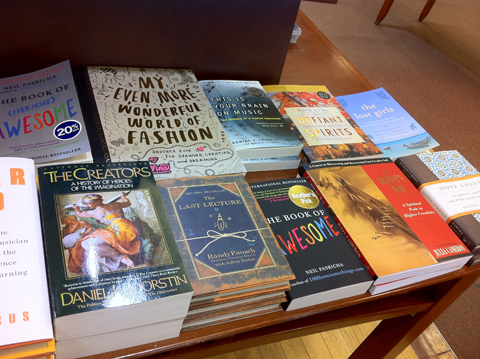 No wonder I was so enthralled with every single book on this table! 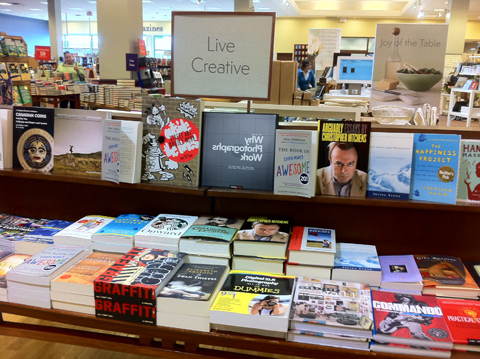 After deciding to pick up Unstuck by Noah Scalin (which I’m LOVING) I walked around to the other side of the table… Live Creative.. very clever. Evaluating art is a dicey topic – particularly in relation to how teachers evaluate and assess the visual arts in elementary school classrooms and how that affects our children. 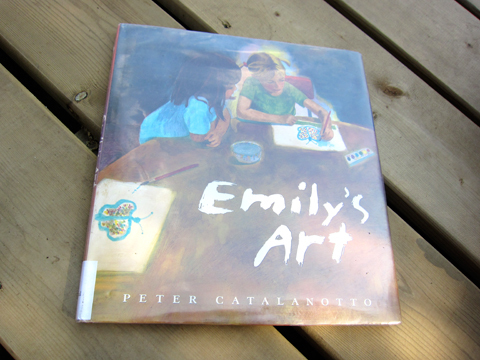 Peter Catalanotto’s book Emily’s Art covers this subject appropriately by illustrating a story of a young inspired artist encounter a less than inspiring art contest experience. Emily’s story is compelling and heart breaking. The principal’s mother is brought in to judge the art work. She justifies her qualifications by declaring “My cousin is married to an artist” – hilarious! 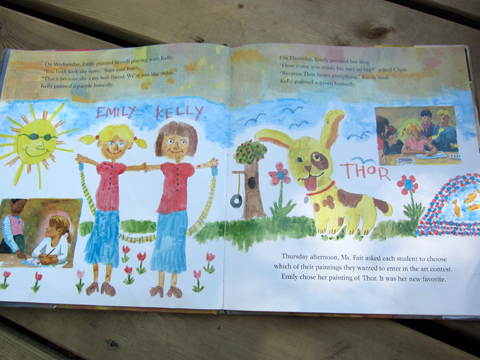 She falls in love with Emily’s painting until she learns it’s a dog (not a beautiful rabbit as she thought) and proceeds to dismiss the art based on a bad experience she had with a dog! When you consider all of the little kids out there that have been turned off of art because they don’t think they’re good enough or that their painting of a tree doesn’t look like a realist representation of a tree, it’s really sad. This is most definitely a story worth sharing with your kids. My library copy is overdue. I most definitely will be buying this book for our collection. I’ll leave with Catalanotto’s dedication which I just love: For all children who paint with their hearts.